In my 7th week of unemployment/being an artist I have started to get over the initial shock and nasty depression. I apply for jobs but companies aren't hiring in visual effects, not cg hair groomers with little knowledge of commercial software anyhow. On top of that, the lovely Los Angeles summer will start to fry my brains soon so I better get some things done before that happens. Los Angeles in summer is hell and don't let anybody tell you otherwise. I need to pull myself together and go for it, basically. I need commissions, sales, workshops, marketing....I need a business plan. Ideas to make money. Ideas to promote myself. Ideas to educate myself. In the meantime, I've been painting, applying for events, doing some commissions which I can't post because the people that commissioned them haven't given them as gifts yet, sigh. 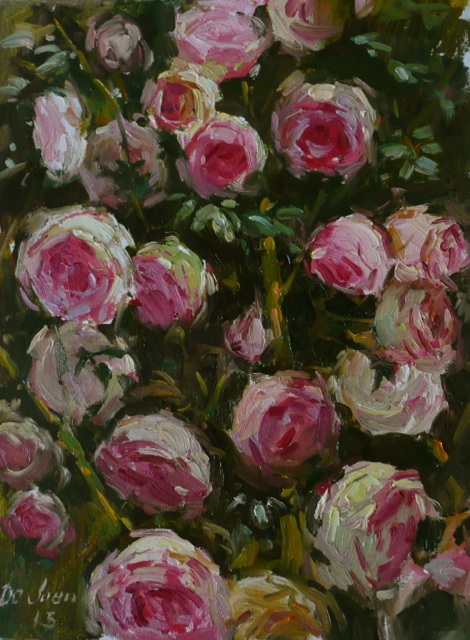 "Eden Roses" painted at Roger's Garden's. 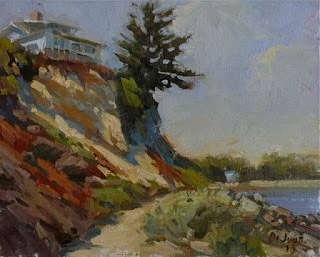 12'x9"
One thing I've done is visit two local artists that I admire a great deal. Junn Roca and Eric Merrell. Junn Roca makes a living out of painting, period. His wife Frannie is his devoted promoter and cheerleader. They have put 4 kids through college. All on art and scholarships mind you. That , I think, is being a professional artist. No arguments. On top of that Junn and Frannie are extremely nice people and Junn makes a coffee that could wake up the mummies in Egypt. My visit to his studio was eye-opening. We talked about the business and hard work of art. Eric Merrell. Well, I'm seeing him tomorrow so I'll just say that he is an awesome artists that builds his own frames and seems to have quite a calm and well tuned demeanor that I admire. It shall be interesting to know a bit more about him. I also befriended Ezra Suko. A young artist recently back from Iraq where he was stationed. He already has three galleries representing him and is painting full time. Now that's the way to go. Some good news as well. 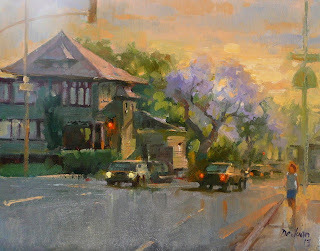 I got a big nice commission I'm working on and I became a signature member of LPAPA and I finished my series of classes at Willard Elementary as part of the "My Masterpiece" program of PSUD and the California Art Club. That was a very satisfying experience. So not all is waste and wow-is-me. In the meantime, I did paint. Here are some things that I produced. I scheduled a few shows locally and I'm keeping busy. I've even decided I might need to start my own business with a friend. But that's also very preliminary so I won't talk about it. What I have decided is to make a Business Plan so that everything is taken into account as much as possible. And to stir things up a bit I am reading Leslie Saeta's 30 marketing ideas in 30 days to get things moving. She is a slick operator Mrs. Saeta. The essential part is this: My art adventure is now real. Whether I fail or succeed is entirely up to me and what I am sharing in this blog now is "the thing", not tips, not digressions on composition and beauty. Like Voltaire's Candide, I'm over this being the best of possible worlds but I'm leaving Eldorado. (what did I just say about digressions?, I guess I can't help it.) BUT, the first thing I'll share is my new spanking business plan for everyone to tear apart. Keep you posted. Dear Jose, wow..thats an honest submission there..
You paint really well and let nothing come in your way.. Thank you Niharika! I'll do my best. I stumbled on your site looking for info on Calvin Liang's workshops and such. Your works are very good. I'm impressed. I can relate. I resigned my job in January 2011 to help my dad with his battle with cancer. I'm still unemployed, but glad to know I helped him with his end of life journey. 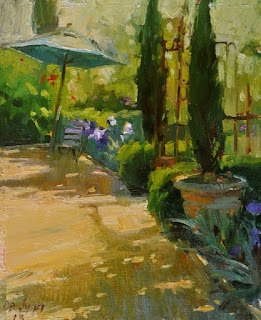 It's frustrating to have a passion as a painter only to find it so difficult to make a living at it. I'm looking to get back into corporate America, not because that's where I want to be, but because I have to feed and care for myself. I will continue to hope to make a profession as a painter. But if in the end, all I've done is enjoyed time with the brush and the great outdoors, well...that's much better accomplishment than being in a cubicle helping global multinationals move cheap goods. Painting is fulfilling in and of itself. Hope you have the fortitude to keep applying brush to canvas and even more fortitude in finding a way to earn a living at it. Much of what I understand is that the market is very saturated with pretty good painters. So it takes even harder work to get noticed in the market place. Keep trying my friend, never give up hope, and enjoy the journey. lovely work. how do i follow you via blogger? Thank you Robert. I think I'd rather die than not paint but , like you say, food has to be bought. After talking to all kinds of people I'm not sure how full time painters make it work so I am looking for a new job.I'm not that smart. Since my industry is just shedding people right now, I'll have to find a new "career" somewhere so a appreciate your sympathy and I think you should feel it was a GREAT gift that you helped your father. Liana, I think you just click on the subscribe button to the left where it says "subscribe to this blog". Not exactly sure. I think the unspoken truth is that it is very difficult to make it on selling art alone unless you are a Schmid, Behrens. I've heard from fellow artists that even Scott Christensen struggles at times. I think the reality is that you can make it if you make workshops, licensing, online DVDs/Videos work. In fact, more of my artist acquaintances seem to generate most of their income from those sources. So do what ever you can to support yourself so you can keep making art. I think the supply side in art is so high now and like many others point out the quality of some of these works makes it difficult for good artists to earn a living. Of course, you could always don a brimmed hat and claim Russian lineage or something like that. I always get a kick out of "John Doe, born in Russia, has all the secrets of the Russian masters"
Why? Because he's Russian? give me a break. Make GREAT art. Market it furiously and at every opportunity. FIGHT for creating market awareness of you and your art. I really hope you maintain your optimism, believe in yourself, and keep on keeping on. And if you have to have a job, too, well there's no shame in that! I have just discovered your blog and LOVE your stunning paintings! 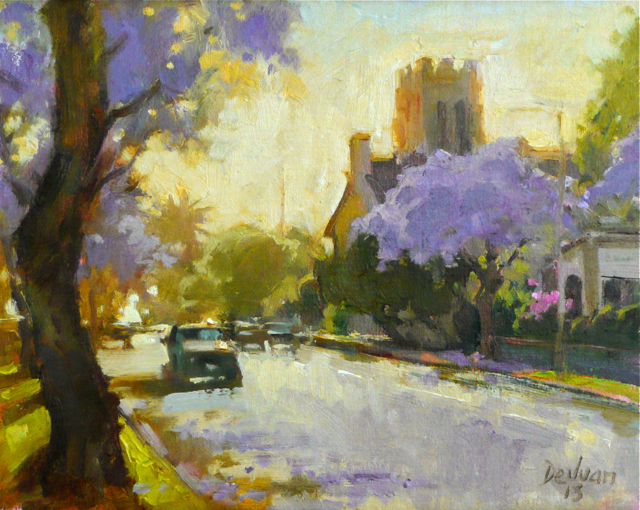 Jacarandas are amongst my favourite trees and you have rendered these beautifully! All the very best with your art career - you certainly have the required talent. Unemployment can really be a nuisance, but there's always a brighter side to everything. Just look at all those beautiful paintings you've made with all your free time. Not to mention all the business ideas that came running through you. So have you finally decided to put up your own business?